My master's project extends the local atmospheric correction from MODIS Aqua to the Suomi-NPP VIIRS sensor in order to identify phytoplankton bloom phenology throughout the Salish Sea. We are excited to have partnerships with the Pacific Salmon Foundation, MITACS and MEOPAR to help make this possible! Contributor: Geomorphic and geologic controls of geohazards induced by Nepal’s 2015 Gorkha earthquake, Science 2015. In summer 2016 we acquired two satellite images covering Cowichan Bay and the Gulf Islands, at the same time that three groups of volunteers from Pender Island Conservancy, Mayne Island Conservancy, and Cowichan land trust led by Leanna Boyer from Sea Change mapped the exact location of kelp beds using Kayaks and GPS. From this data we are able to ground truth what we define as kelp in the satellite images. In the spring and summer of 2017 in situ surveys of kelp beds were conducted to understand how juvenile salmon from the Cowichan River use kelp bed habitats as they migrate north. 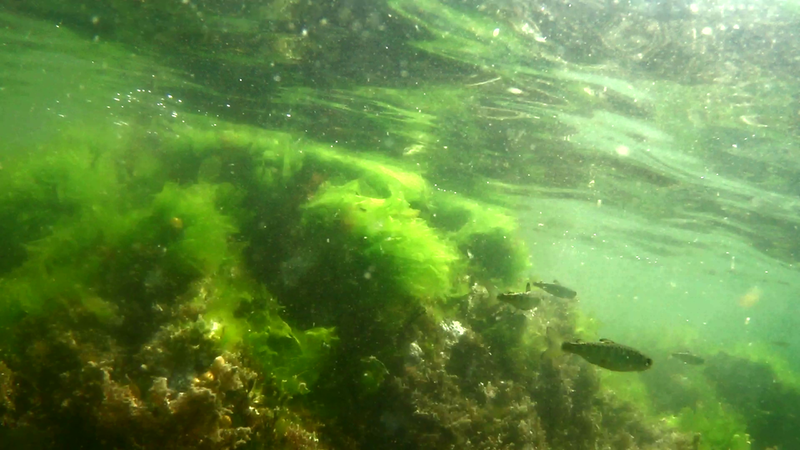 Snorkel survey and remote underwater video was used to compare the use of kelp beds to adjacent no kelp habitat. Remote sensing, aerial photography, UAVs, Geographic Information Systems, nearshore and intertidal habitats, seagrass mapping, land/sea interactions, land use change, eutrophication and nutrient loading, fisheries, freshwater salmon habitats, environmental restoration. Using archived historic aerial photography and imagery captured by Unmanned Aerial Vehicle (UAV), I am working to assess seagrass distributions change in the Salish Sea, British Columbia from 1932-2016. Report: Oil Spill Detection with Radarsat-2 on BC Coast. Submitted April 2015 to Ocean Networks Canada. Nathan has a background in databases, data mining, and machine learning. For his thesis, Nathan worked on a program that processes data from optical instruments and tablets installed on the BC ferries as part of the FOCOS program. His integral role in this program ensured that data was cleaned for quality control and output into a format that was useful for further analysis.